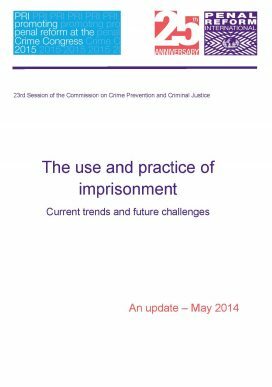 First presented in April 2013 to the 22nd Session of the UN Commission on Crime Prevention and Criminal Justice in Vienna and updated for the Crime Commission in May 2014, this discussion paper The Use and Practice of Imprisonment: Current Trends and Future Challenges looks at current trends in prison populations, the use of new technologies in the penal system, and challenges facing penal systems around the world, including overcrowding. This paper will form the basis of a new annual publication – Global Prison Trends, which will provide an update on global developments in penal reform and criminal justice each year and will be launched at the five-yearly Crime Congress in Doha, Qatar in April 2015. This paper is supported by an expert blog series in the run-up to the Crime Congress and in celebration of PRI’s 25th anniversary year. Read more about the blog series and the annual publication here.